FILE - Migrants walk to registration and transit camp after entering Macedonia from Greece near the southern Macedonian town of Gevgelija, Saturday, March 5, 2016. Austria has endorsed four Balkan countries' decision to close their borders this week to almost all migrants, and called for the migrants' path to remain closed indefinitely. Austrian Interior Minister Johanna Mikl-Leitner says her government supports the action to restrict immigrants trying to cross the Balkans to northern Europe. This week's action by Slovenia, Macedonia, Serbia and Croatia applies to all migrants except those planning to seek asylum in those four countries. Mikl-Leitner told the German daily Die Welt Thursday that the so-called "Balkan route" for migrants should stay closed permanently, because - in her words - "The clock will not be turned back." Meanwhile, Turkish news agencies say five migrants, including a three-month-old infant, have drowned off Turkey's western coast after a boat taking them to Greece sank on the way to the island of Lesbos. The U.N. human rights chief, Zeid Ra'ad Al Hussein, says such a plan would be illegal. "I urge the EU to adopt a much more rights-compliant and humane set of measures on migration" at a summit scheduled to begin March 17, Al Hussein told the U.N. Human Rights Council in Geneva Thursday. "International guarantees protecting human rights may not be side-stepped or diluted," he added. "Any returns of people must be in conformity with international human-rights standards. Arbitrary and prolonged detention must be avoided." 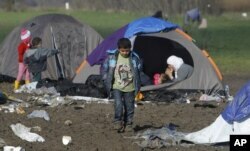 FILE - A boy walks through mud in an improvised camp on the border line between Macedonia and Serbia near northern Macedonian village of Tabanovce, Tuesday, March 8, 2016. After months of disagreements among the 28 EU nations, EU leaders said this week they will give Turkey more than $3 billion to help with the costs of hosting nearly 3 million Syrian refugees. In exchange for Turkey's help in stemming migration flows to Europe, the deal would include ease European visa requirements for Turks and a promise to speed up talks about Ankara's application to join the EU. A tentative agreement also calls for the EU to resettle one Syrian refugee from Turkey in return for every Syrian refugee Turkey takes back from Greece. 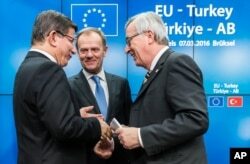 Turkish Prime Minister Ahmet Davutoglu, left, speaks with European Commission President Jean-Claude Juncker, right, and European Council President Donald Tusk, center, after a media conference at an EU summit in Brussels, Belgium, March 8, 2016. Tens of thousands of migrants from Syria and other countries are now stranded in Greece, blocked from their goal of reaching northern Europe since Macedonia closed its border Wednesday. The situation near the Greek-Macedonian border was described as dire this week. Authorities say nearly 36,000 migrants and refugees are stranded in a muddy, unhygienic camp near the Idomeni border crossing into Macedonia. 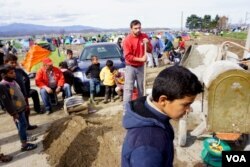 Others are stuck in Macedonia near the Serbian border, in a "no-man's-land" between the two countries' frontiers.